San Francisco is a food truck mecca. From burritos to Irish/Eritrean fusion—if you can think of it, someone's probably already serving it out the back of a van. But where does one get a sudsy man soda to wash down his artisan lamb sliders? 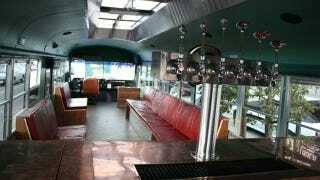 From the only mobile taproom within city limits—Brewtruc. The Brewtruc, which debuted October of last year, is the brainchild of Hugh Schick, a San Francisco-based catering truck designer and it grew from his previous work on the ultra-popular Le Truc mobile eatery. "The phrase Le Truc means 'Gizmo'," Schick explained to Gizmodo. "I thought is was a good pun on truck but also on gadgets—it's the ultimate gadget." And boy, what a gadget it is. Schick first scored a gently-used, 1997 40-foot school bus with 90,000 miles on its AT466 Cummings diesel engine for a measly $4,000. He then spent an additional $55,000 converting it into a mobile bar. Schick and his team installed a 93-inch keg fridge in the rear of the bus that holds six full-sized 15.5-gallon kegs from local artisan brewers. These kegs feed 12 individual taps—six interior and six exterior—and are cooled by a five-gallon glycol chiller system. A propane-powered generator runs the system when the engine is off. To make room for all this equipment, Schick used the lightest materials he could and removed a large majority of the bus' heavy wooden seats, cutting five skylights out of the raised roof and shifted the remaining benches against the side of the vehicle. "We're arranged for comfort and interaction, not for maximum capacity," Schick said. The bus was originally rated at 33,000 lbs GVWR however the retrofit eliminated nearly 7,000 pounds of excess to bring the weight rating down to just 26,000lbs including 93 gallons of hooch and 26 guests. The Brewtruc is typically hired as a livery service toting patrons around the City while dispensing local nano-brews. But how does one serve beer in a moving vehicle legally? Schick actually found a very slick adherance of California Department of Alcoholic Beverage Control regulations—he registered the bus as a limo which is regulated by the Public Utility Commission. This has the added bonus of making the Brewtruc the only public space in San Francisco where one can legally sell homebrew beers. [UPDATE: As Hugh clarifies in the comments below, "We cannot sell beer at all per se, but we can include it as a fringe benefit of taking a ride."] Since artisan brewing doesn't have to adhere official ABC food safety regulations, it is illegal to consume it outside of the home unless the space (say a PUC-regulated bus) is exempt.